What is it about bubbles that makes things so much better? Soap, bathtime, and even regular old drinking water are all radically improved by adding these little spheres of gas and joy. This is so readily apparent that Pepsi, which is pretty much the exact opposite of water, is buying SodaStream, an increasingly big name in the sparkling water game. For a cool $3.2 billion, or $144 per share, Pepsi is acquiring SodaStream, which is known for its at-home seltzer machines. If you're a fan of sparkling water and have some stake in its rise as a soda alternative, this is good news. If you're not one of those people, this is probably neutral news. But it's definitely news. "PepsiCo and SodaStream are an inspired match," said PepsiCo Chairman and CEO Indra Nooyi in a statement. "Daniel and his leadership team have built an extraordinary company that is offering consumers the ability to make great-tasting beverages while reducing the amount of waste generated. That focus is well-aligned with Performance with Purpose, our philosophy of making more nutritious products while limiting our environmental footprint. Together, we can advance our shared vision of a healthier, more-sustainable planet." As you can tell by Nooyi's statement, this is in line with the recent vogue of health- and sustainability-focused products -- a vogue that seems like it can only be a good thing. 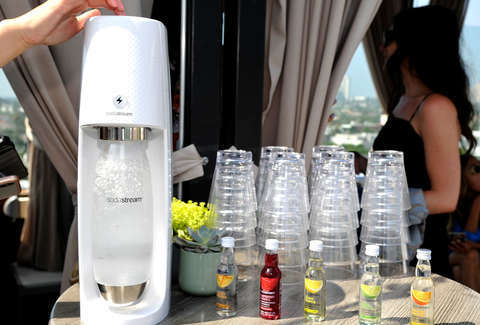 As its name suggests, SodaStream originally started as a soda company but has itself seen huge success since it pivoted to sparkling water. And we can all agree that a world with more bubbles in it is a better world.